A new way of creating and printing labels and messages by just 4 clicks. UBS Designer is a graphic software, of United Barcode Systems, for creating and editing labels and messages. It is multilingual and with WYSIWYG interface. 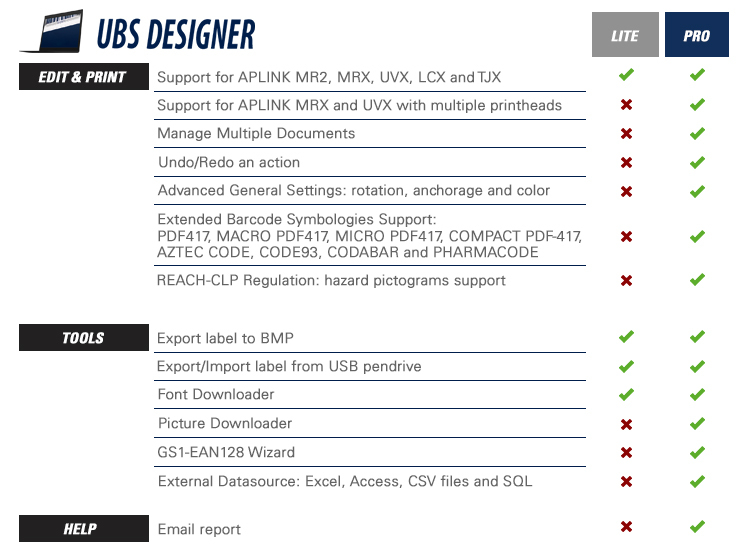 With UBS Designer, the users can creating their own messages for the different labeling, coding and marking equipments, with fixed or variable texts (Excel, Access, SQL, CSV), images, logos, datas, counters or barcodes, following the GS1 regulation. UBS Designer is completely compatible with Windows 10 and includes Ethernet or USB communications. It allows all the printers to communicate with the codifiers of UBS. In addition, UBS Designer binds UBS LabMan to communicate data with the ERP/MES. UBS Designer incorporates the necessary pictograms to print the labels and messages following the Reach CLP. Barcodes 1D and 2D (GS1-128, GTIN-13, GTIN-14, QR, GS1 DATAMATRIX and more). Capacity to modify font type and size of “human readable” in the barcode. Add your own barcode to the label customizing its content with standard compliance parameters by default. Create your barcode with fixed or variable fields, counters, dates or combination of all them. Bar width adjustment capability to achieve perfect contrast and 100% readability on any porous surface. Special features to create and print a label just in 4 clicks. Automatically checks for new versions available (internet connection required). Function for alignment of multiple objects. Create data and time fields allowing day, month and year offset for best before date generation. Modify the label width from right-click from context menu. Toolbar for quick text format adjustment. Import images to your label including these formats:BMP, JPG, JPEG and PNG. Automatic resize to fit the label dimensions. Optimized algorythm for image conversion.